View More In Fresh Cut Flowers. This best gifts are made for sharing, and this one definitely delivers! 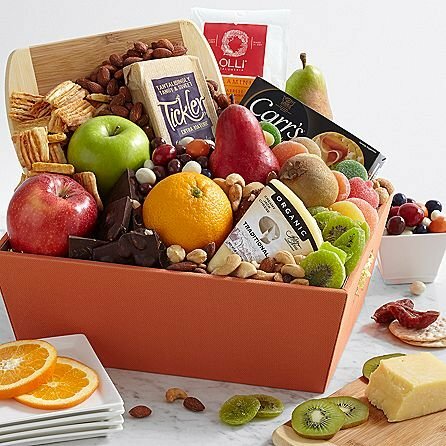 Whether they're enjoying an outdoor picnic or a wine night by the fire, this basket is overflowing with gourmet finds they'll love. First, they'll enjoy fresh fruit, including crisp pears, delicious apples and more. They'll also receive our savory favorites, featuring everything from irresistible Tickler Cheddar Cheese and Olli Calabrese Salamini, to roasted salted almonds and cheese crisps. Finally they'll delight in sweet surprises that are perfect for sharing, including dark chocolate almond bark, sugared fruit candy slices and more tempting treats. Their gift will arrive in a beautiful reusable coral tote, and includes a bamboo cutting board for the perfect finishing touch. 1 D'Anjou Pear 1 Crimson D'Anjou Pear 1 Breaburn Apple 1 Granny Smith Apple 1 Kiwi Fruit 1 Navel Orange Olli Calabrese Salamini (3 oz.) Tickler Cheddar Cheese (7 oz.) Sierra Nevada Organic Creamy Jack Cheese (6 oz.) Carr's Water Crackers (2.2 oz.) Cheese Crisps (3 oz.) Roasted Salted Mixed Nuts (3 oz.) Roasted Salted Almonds (3 oz.) Dark Chocolate Almond Bark (3 oz.) Chocolate Covered Mixed Fruits (3 oz.) Sugared Fruit Candy Slices (3 oz.) Dried Kiwi Fruit (3 oz.) Bamboo Cutting Board Approx. 8" x 5.5"
7-day FRESHNESS Guarantee with Doorstep Delivery. If you have any questions about this product by eshopclub, contact us by completing and submitting the form below. If you are looking for a specif part number, please include it with your message.